Due to lack of mobility for some residents in Saskatoon, Saskatchewan, getting to the eye doctor for regular examinations is difficult. For a few lucky residents, FYidoctors make a special trip to seniors’ housing to conduct vision tests and assess overall eye health. Upon hearing the dilemma back in 2016, FYidoctors optometrists Dr. Rachael Berger and Dr. Kendahl Scharback decided to offer St. Ann’s Senior Citizens Village a mobile clinic service. Dr. Berger brings with her one or two opticians who offer adjustments and cleanings. The optometrists check the health of patients’ eyes and ensure prescriptions are up to date. After the eye exam, the staff return to the clinic to process orders. Once complete, glasses are delivered to the patients. 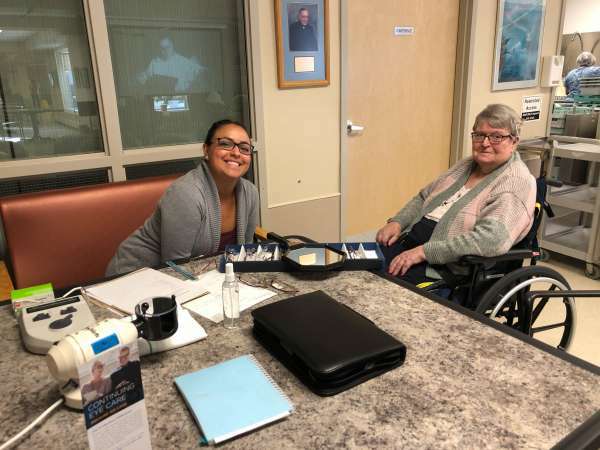 Now, on a regular as-needed basis, the eye doctors visit approximately five care home locations that are home to patients who have mobility issues. Patients include a diverse range of ages between 17 and 85. “You are always so appreciated there by staff, patients, and go home exhausted, knowing that you fulfilled a need within the community,” said Dr. Berger.